For more than 200 years, Remington has been one of the most respected names in the shooting world. With a rich history and longline of legendary firearms, Remington is known for both tradition and innovation. 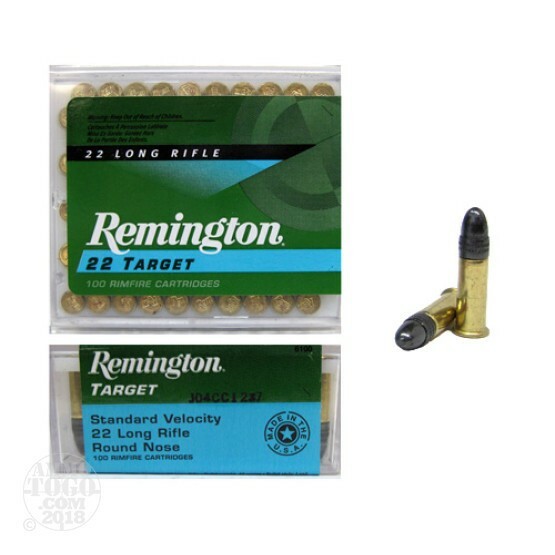 A world leader in rimfire ammunition, Remington brings quality performance and reliability to the table with this .22LR target ammunition. Perfect for serious target competition or casual backyard plinking, each of these factory fresh cartridges is loaded with a 40 grain lead round nose projectile. Propelled by powder and primer charges measured to exacting tolerances, these rounds deliver match-grade accuracy and reliable terminal performance. Each of these new production rounds produces a consistent muzzle velocity of 1150 feet per second with 177 foot pounds of muzzle energy. Each box contains 100 rounds of non-corrosive ammunition, reducing the chance of running out during competition or high-volume target practice.